"A special hello to hospital patients and shut-ins, the pensioners, the blind, all the people who don't get out to games but enjoy the hockey broadcasts..."
Growing up in British Columbia in the 1980s I was the biggest Vancouver Canucks fan. I'm not exactly sure how that came to be though. The only thing more brutal than Canucks win-loss record in those days was their jerseys. It would have been a whole lot easier to be an Oilers fan. Hockey Night in Canada rarely showed Vancouver games. It was always the Leafs, sometimes Gretzky's Oilers. More often than not though my dad had the Montreal game on the French channel, watching his beloved Montreal Canadiens. These were the days before satellite tv and specialty sports channels. I had to rely on radio broadcasts, and our local station only picked up maybe 2 or 3 games a month. Living in the mountains made it impossible to find the Vancouver stations on the dial. But if I was really lucky the game would be simulcasted on BCTV and I could actually watch my Canucks look ugly in those V jerseys. But I savoured every radio broadcast and those beloved BCTV telecasts. Why? I think, actually I know, play by play man Jim Robson was a huge reason for that. Robson is a broadcasting legend with the Canucks. Though he worked many games for Hockey Night In Canada and was honoured by the Hockey Hall of Fame, he was never narcissistic enough to get himself the title that he so completely deserved - the best play by play man in the business. Yes, I was completely spoiled with Robson calling the Canucks games, and I think I knew it even way back then. Robson had the amazing ability to captivate an audience and re-create the play for a radio audience so vividly that it became such a treat to listen to him. I think he is as much of the reason I remain not only a huge Canucks fan but a huge hockey fan to this very day. Back in December 2005 author Jason Farris created circaNOW! Productions, and, in conjunction with graphic designer Adrienne Painter, came out with the critically acclaimed book Hockey Play-By-Play: Around The NHL With Jim Robson. The book lets hockey fans re-live over fifty games from the 1970s to the turn of the century. Farris does an excellent job in recreating each game, completing a unique feel through Robson's comments and memorabilia. And don't forget Robson worked many games for Hockey Night In Canada, including several historic games and three Stanley Cup finals. This is a book for all hockey fans, not just Canucks fans. Farris does a good job of bringing the book all together. It must have been a dream come true for Farris to sit down with Robson and talk hockey for hours on end. It was not easy though, as Robson was apparently quite reluctant to do the project in the first place. I'm going to guess Farris' passion sold Robson on the idea. The passion is completely evident throughout the book. He created his own production company and designed the book himself, obviously taking great pride and joy in seeing his vision come to life. The best part about this book is much of the proceeds are being donated to the Canuck Place Children's Hospice, a charity dear to the heart of Jim Robson. In order to maximize the charity donations most copies of the Robson book are sold online. 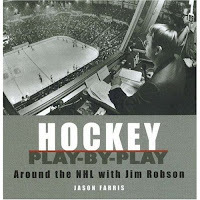 It is likely very tough to find a new copy in any bookstore nowadays, but you can still order copies by going to www.robsonhockeybook.com and clicking through to either "illustrated/gift books" or "book deals" sections on the left hand side of the site. By the way, Farris, a Vancouver born, UBC/UofT/MIT educated financial mogul who loves hockey, also has written a similarly styled book in Hail Cesare! Trail through the NHL, a look at the life and career of former NHL goaltender Cesare Maniago. It, too, is available at www.robsonhockeybook.com. I will be reviewing that title in the coming weeks as well. Spoiled growing up with Jim Robson doing the Canucks play-by-plays? He's the reason you're a hockey fan to this day? Me too. You're so right.